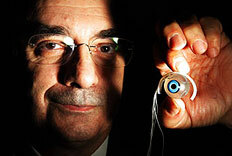 A new bionic eye prototype was introduced by Minas Coroneo of the Prince of Wales and Sydney Eye Hospital last week. This approach differs significantly from the bionic eye prototype successfully implanted in blind patients in London last week (see 'Bionic Eye' Argus II Retinal Implant). Dr. Coroneo and his team have been working on this technology for several years. It uses a tiny camera to collect image data, which is then processed. Rather than being passed to electrodes that sit on the surface of the retina, the Australian device is less invasive. It makes use of research that Dr. Coroneo did several years ago, using technology similar to that used in cochlear implants. The trials involved placing small electrodes on the surface of the eye then using an electric current to stimulate the retina, the thin layer of cells in the back of the eye that respond to light. The new 'bionic eye' device uses a special prosthetic that sits on the surface of the eye; thirty electrodes pass on the image data. Patients are less likely to lose any residual eyesight. Read about the sf connection to bionic eyes; story via The Australian; thanks to Moira for contribiting the tip on this story.